Its been a very long time since I posted anything on this blog. I'm actually quite excited to have found this really nice clean template. Less clutter and more elegance. As I figure out all the special features I'll be posting more often. For me it really takes some visuals to motivate me and get my juices flowing again. 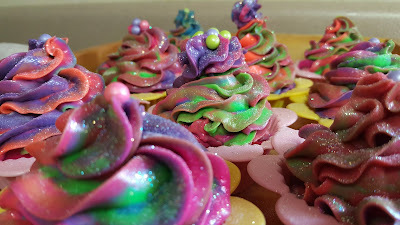 A few days ago I made some really colorful cupcakes. Exactly 21, to be exact and they look so beautiful. I didn't start out with the idea of making cupcakes. But that's what it turned in to. They're made with Olive Oil, Shea Butter, Coconut Oil, Castor Oil, Sunflower Oil, Soybean Oil., Raw Aloe Vera and Goatsmilk..